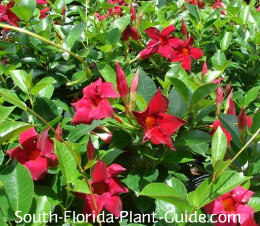 Showy mandevilla vine is a classic South Florida favorite that says Home Sweet Home. Available in many colors and varieties, it blossoms most during warm months. No matter where it's planted, this vine takes center stage with large trumpet-shaped flowers and deep green foliage. Probably the best-known variety is a pink mandevilla called 'Alice duPont' mandevilla with romantic pink blossoms. 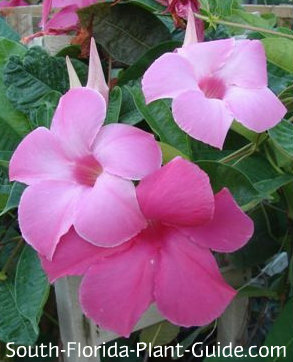 This vine is sometimes referred to as pink allamanda. 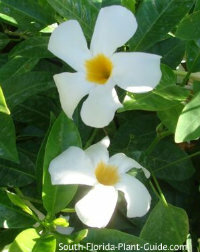 There is also a popular white-flowering variety (Mandevilla boliviensis) as well as other color choices. The most common yellow-flowering variety is actually not a mandevilla at all (Urechites lutea or Pentilinon luteum) - and a common name for this vine is Wild Allamanda. 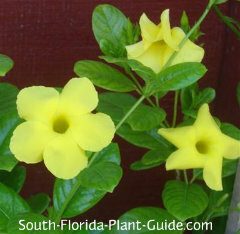 It's no wonder people confuse the terms mandevilla and allamanda. ...Gaining in popularity is a group with more compact growth - dipladenia (the name we'll use here to keep the varieties straight) - which has had its name changed to mandevilla. A dipladenia twines naturally but not as strongly as other mandevillas. It may need your help to train where you want it to go. It's probably too small a vine to cover a large trellis or arbor but will do well on a smaller trellis, post or fence railing. It even works in a hanging basket or as a small viney shrub. One of the biggest attributes of this beautiful vine is that it will flower in more shaded areas than the rest of the mandevillas. All varieties are fast growers but very manageable. Dipladenia stays smaller and bushier than the others. 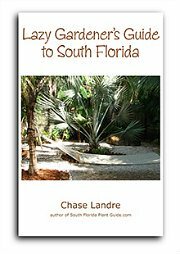 These tropical vines need the warmth of Zone 10 and an area protected from winter winds. In Zone 9B you can actually grow a mandevilla vine as an annual vine since it's a fast grower or use it as a container plant to move inside during cold weather. Most prefer full to part sun, though dipladenia can take part shade and will flower nicely there. If growing in a row, place the plants 3 feet apart...dipladenias can go 2 feet apart. Add composted cow manure to the hole when you plant this vine. 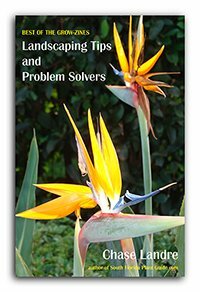 Trim back as needed during warm months but avoid too much trimming since flowers are produced off new growth. Cut back harder in early spring (mid to late March) for size. Water on a regular basis but make sure not to overwater. It's very important to let these vines go dry between waterings. 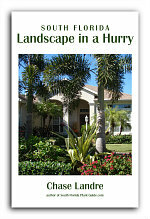 Fertilize twice a year - in spring and fall - with a good quality granular fertilizer. You can also supplement feedings during warm months with bone meal and/or liquid to encourage more flowers.